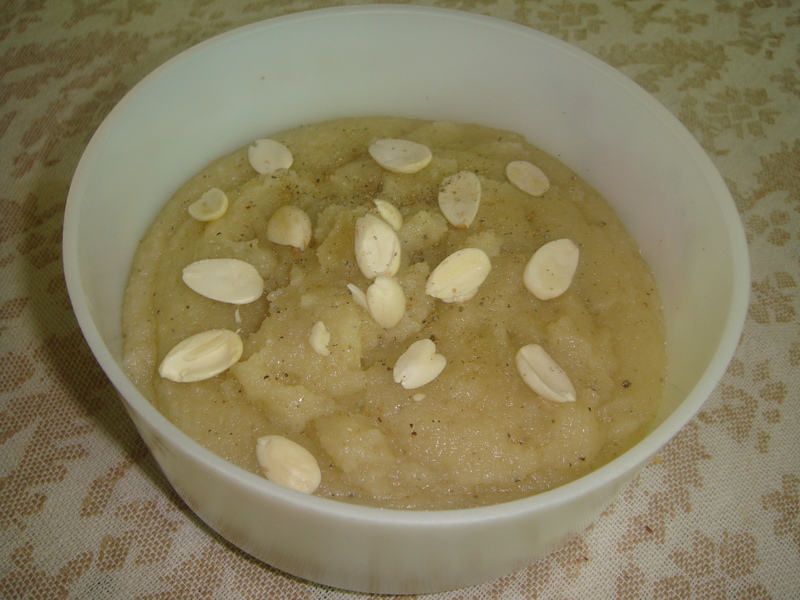 Hi friends!Suji/Semolina halwa is a simple yet delicious and yummy sweetened semolina, fried in ghee and garnished with nuts. Its also popularly known as Kesari bath in the southern region of India. In a wok/ Kadahi, melt the ghee add the sooji and stir fry over medium heat, stir it continually for about 8-10 minutes. When the sooji is light golden in colour and does not stick together much , it is well fried . Pour the hot sugar solution into the fried sooji gently and carefully, stirring continually. Add cardamom powder and bring to a boil, stir continuously. Once the water is added, to the suji mixture, stir well so that no lumps are formed. Suji / Semolina absorbs the water added and swells. Thoroughly mix let whole mixture, cook for 5-6 minutes more. keep on stirring so that the Suji halwa does not stick to the wok / Kadahi and starts leaving the sides. Suji halwa is ready now. Serve hot, garnished with the almonds.